Writing and studying history is a matter of sifting through often incomplete data and interpreting it to arrive at a conclusion. Sometimes new evidence, dug out from either archives or from archeological excavations, comes to light and what was once dogma must be rethought and reinterpreted. Recently a similar process has happened with Barcelona's Drassanes Reials, or the Royal Shipyards. The building, located at the bottom of Las Ramblas near the Columbus monument and the harbour, is home to the Maritime Museum. For decades history books and tourist guides have touted the Drassanes as one of Europe's foremost examples of industrial Gothic architecture but recent archeological and archival investigations have forced a reevaluation of the building and its site. Instead of being a Gothic structure from the 13th century most of the existing building is now considered to have been built a century and a half later “in the Gothic style.” It may be disappointing that the city has “lost” a Gothic monument but we now know a lot more about the building, the site, and about Barcelona's history. In addition, the same archeological excavations have shed more light on the city's history as a Roman colony. The excavations, begun in 2010 and lasting to 2012, were followed by a programme of building renovation including architectural and engineering restorative work. The Drassanes (drassana is the Catalan for shipyard) was a place to build, repair and store ships of the Crown of Aragon's navy. Archival evidence suggests there was a shipyard—perhaps no more than an open area on the beach—on the present site prior to the 13th century but it was not until late in the reign of Pere el Gran (Peter the Great) between 1282 and 1285 that the medieval structure was built. That building consisted of a series of long covered bays under which ships could be assembled or repaired. The shipyard was built just to the west and outside the city walls that roughly followed the line of the present-day Las Ramblas. The shipyard buildings were built on the beach so that ships could de directly launched or recovered. The ships of the King's fleet had to be stored ashore during the winters because Barcelona lacked a harbour with all-round protection. As the Catalan-Argonese fleet grew the shipyard was expanded during the 14th and early 15th centuries. During this time the city walls were also expanded so as to encompass the Drassanes. Most of the existing structure, that which we see today, dates from the late 16th and early 17th centuries. Although Barcelona lacked a proper harbour a spit of land, where the Barceloneta neighbourhood is today located, provided ships with a measure of protection from north winds. 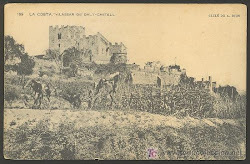 Unfortunately, this also led to erosion of the beach in front of the Drassanes and as a result the Medieval structure was demolished and a new one built partly on the same location but further inland. The recent archeological excavations have revealed the foundations of the piers of the older structure. The new Drassanes was also built in the Gothic style; this is what had confused historians, a building in the Gothic style but built at a later date. Presumably the original structure was found to be functional and when the “new” Drassanes was built the same architectural style was used. This new evidence has explained some discrepancies that arose from the study of old documents. For example, a well-known 1563 image of Barcelona by Anton van der Wyngaerde's had caused doubts about the accuracy of the Drassanes as depicted. But research and excavations have shown that Wyngaerde's image actually depicts the older building and not the present-day structure. The building of a larger Drassanes also implied advances in the art of ship building that occurred between the 13th and 15th centuries. By the 15th century ships were much bigger. Among the ships built in the Drassanes was the Real which served as Don Juan of Austria's flagship at the pivotal battle of Lepanto in 1571 between Islam and Christianity. At the time the Real was largest galley in the world. In the 1970s the Maritime Museum built a full-size replica of the ship and it occupies one of the Drassanes' central naves, and is the museum's showcase exhibit. The size of the Real replica made it impractical to remove during the archeological and restoration work. During the recent excavations the remainder of the museum's permanent exhibit were removed to temporary storage. The archeological excavations under the Drassanes have also revealed something about the Barcelona of two millennium ago, revealing the presence of a large Roman necropolis. The graves of more than one hundred individuals dating from the 1st and 6th centuries provide another layer of evidence to Barcelona's history. While the discovery of the graves does not add to the building's history, it does tell us something about the Barcelona waterfront at the time of the Roman empire. Amongst the excavations were found the remains of a mausoleum which will be visible to the public through a glass floor. One important conclusion taken from the finding of the graves is that the land that the Drassanes sits on was obviously stable, dry and likely some distance from the shore during the Roman era. The dead would not have been buried on an unstable beach. Another conclusion that can be made is that there was likely a road parallel to the shoreline given that Roman cemeteries often lined the roads leading to the gates of the city walls. So even during the time of the Romans the site of the future Drassanes was very likely near one of the gates into Barcino, as the city as known under the Romans. An example of this custom, of graves lining a roadway, are the Roman graves visible in the Plaça de la villa de Madrid in the Barri Gotic. We know that from the time of the medieval city that there was a gate through the city walls adjacent to the shipyard. Over the centuries the Drassanes has served as a military barracks, an arsenal, as a foundry for the fabrication of munitions, and as part of the perimeter wall of the city's defences. The building was transferred to the Generalitat (the Catalan government) in 1936 with the intent of establishing a marine museum but the Civil War interfered with these plans. During the Civil War the Drassanes served as an arsenal for the Republican army and it was not until 1941 that the Maritime Museum finally opened its doors. As part of the recent renovations the museum's facilities have been upgraded and added to. A new insulated roofing system and a new heating and ventilation systems will aid in the preservation of the museum's collection. The upgrading includes a new library and some classroom spaces. While most of the Drassanes was reopened to the public in early 2013, and temporary exhibitions were held during the renovations, the Museum’s permanent exhibits will be back on display late in 2014. This article originally appeared in the February 2014 issue of Barcelona Metropolitan magazine.